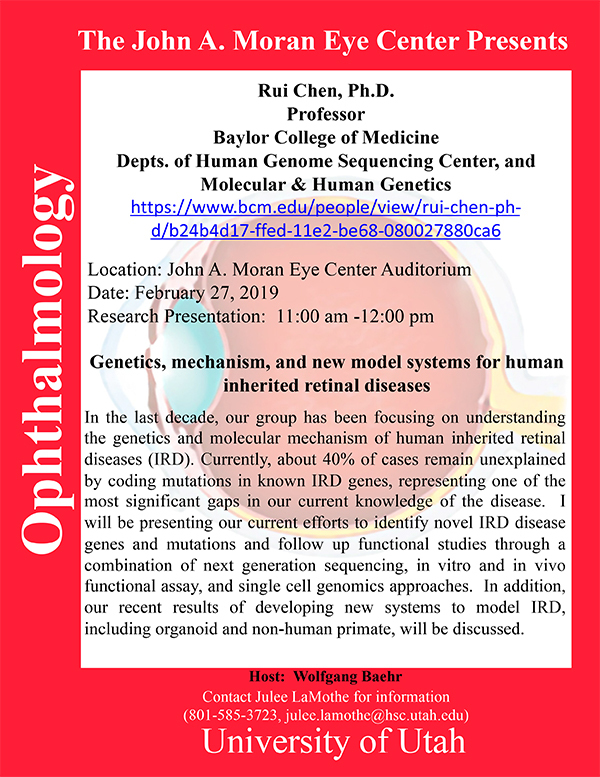 Rui Chen, Professor, Baylor College of Medicine will be delivering a seminar on “Genetics, Mechanism, And New Model Systems For Human Inherited Retinal Diseases” on Wednesday February 27th, 2019 at 12:00pm in the Moran Eye Center auditorium. 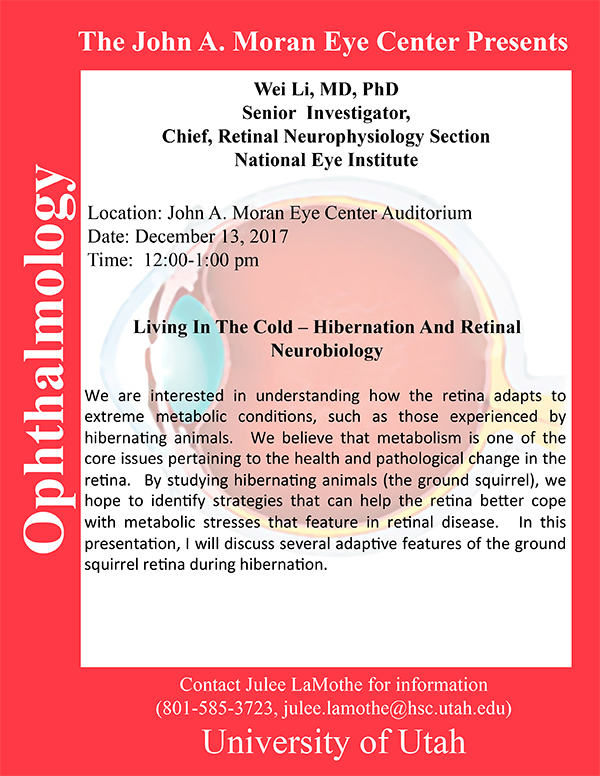 He will also deliver a Grand Rounds Presentation at 8:00am, also in the the Moran Eye Center auditorium. 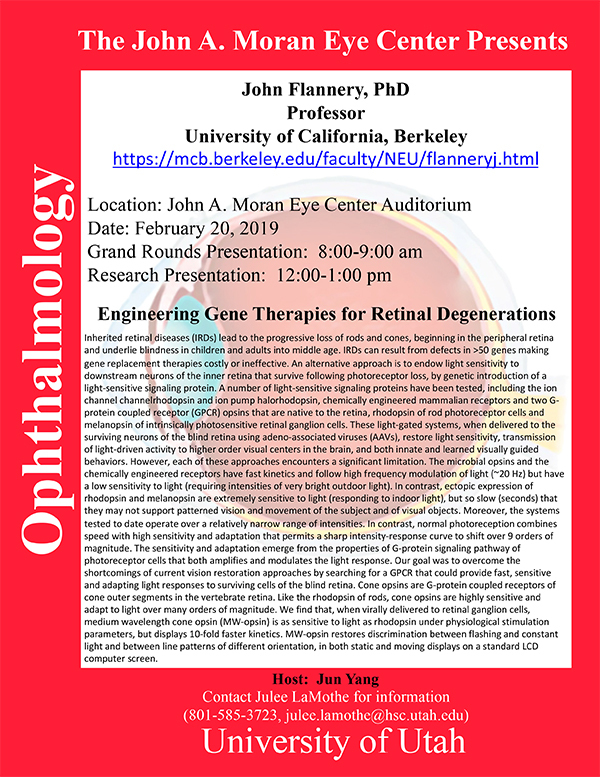 Abstract: In the last decade, our group has been focusing on understanding the genetics and molecular mechanism of human inherited retinal diseases (IRD). Currently, about 40% of cases remain unexplained by coding mutations in known IRD genes, representing one of the most significant gaps in our current knowledge of the disease. I will be presenting our current efforts to identify novel IRD disease genes and mutations and follow up functional studies through a combination of next generation sequencing, in vitro and in vivo functional assay, and single cell genomics approaches. In addition, our recent results of developing new systems to model IRD, including organoid and non-human primate, will be discussed. 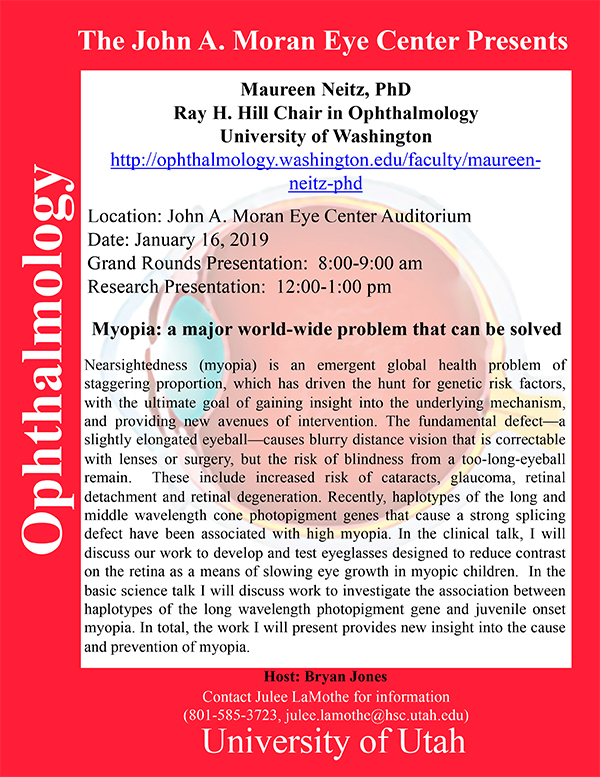 Maureen Neitz, Ray H. Hill Chair in Ophthalmology; University of Washington will be delivering a seminar on “Myopia: a major world-wide problem that can be solved” on Wednesday January 16th, 2019 at 12:00pm in the Moran Eye Center auditorium. 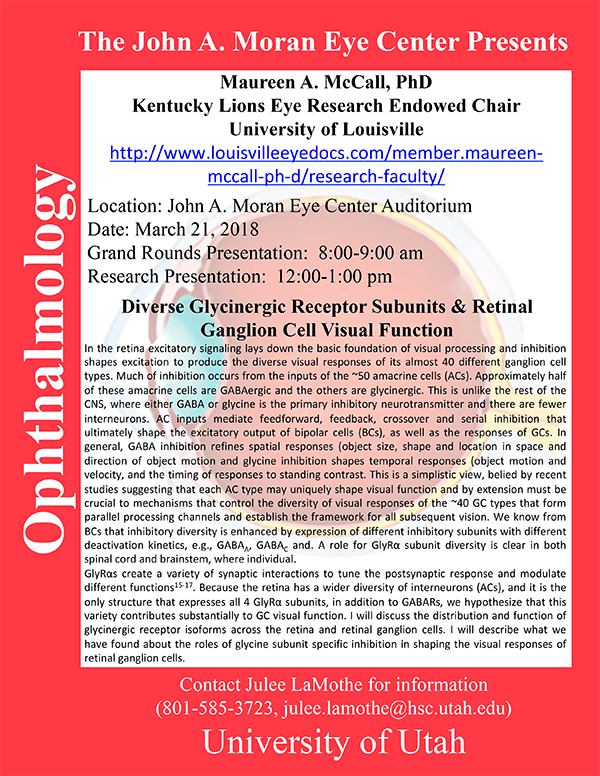 She will also deliver a Grand Rounds Presentation at 8:00am, also in the the Moran Eye Center auditorium. Abstract: Nearsightedness (myopia) is an emergent global health problem of staggering proportion, which has driven the hunt for genetic risk factors, with the ultimate goal of gaining insight into the underlying mechanism, and providing new avenues of intervention. The fundamental defect—a slightly elongated eyeball—causes blurry distance vision that is correctable with lenses or surgery, but the risk of blindness from a too-long-eyeball remain. These include increased risk of cataracts, glaucoma, retinal detachment and retinal degeneration. Recently, haplotypes of the long and middle wavelength cone photopigment genes that cause a strong splicing defect have been associated with high myopia. 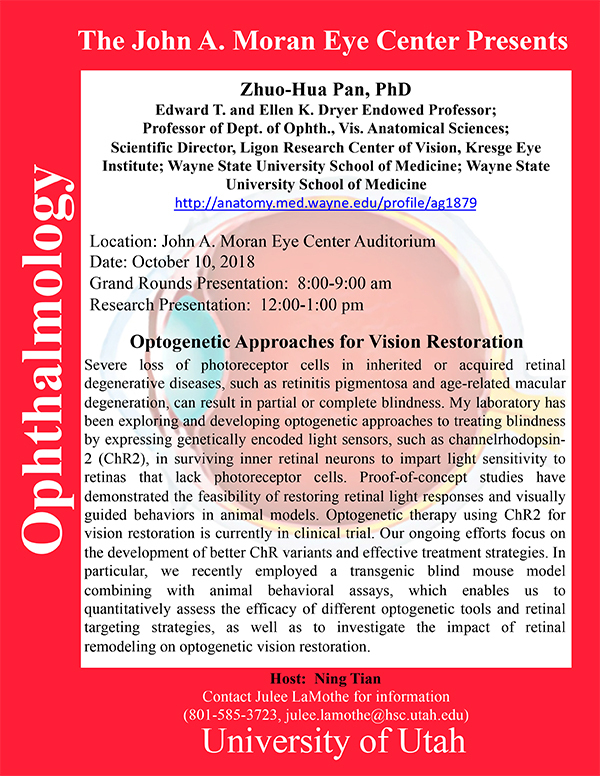 In the clinical talk, I will discuss our work to develop and test eyeglasses designed to reduce contrast on the retina as a means of slowing eye growth in myopic children. In the basic science talk I will discuss work to investigate the association between haplotypes of the long wavelength photopigment gene and juvenile onset myopia. 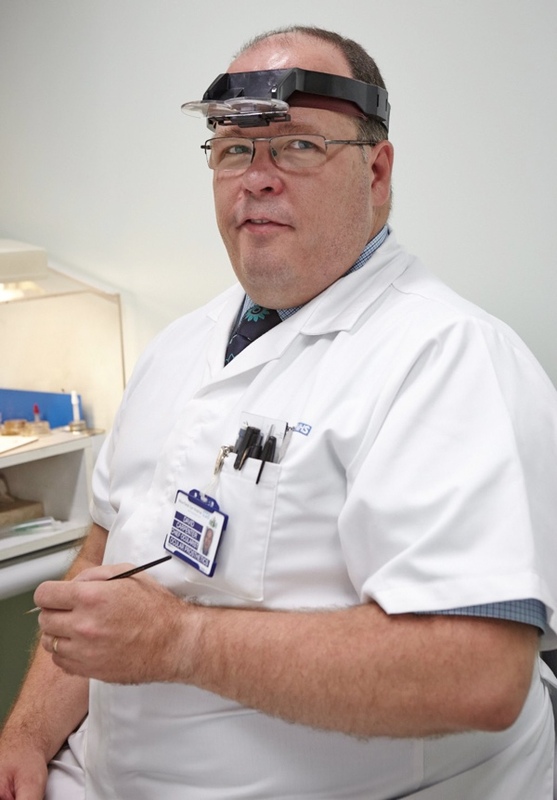 In total, the work I will present provides new insight into the cause and prevention of myopia. 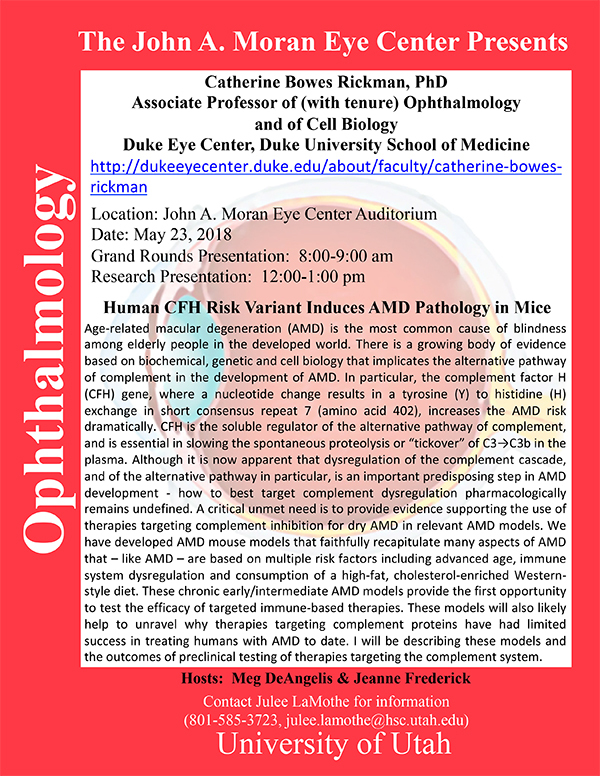 Catherine Bowes Rickman, Professor of Ophthalmology and of Cell Biology at Duke Eye Center, Duke University School of Medicine will be delivering a seminar on “Human CFH Risk Variant Induces AMD Pathology In Mice” on Wednesday, May 23rd at 12:00 Noon in the Moran Eye Center auditorium. Abstract: Age-related macular degeneration (AMD) is the most common cause of blindness among elderly people in the developed world. There is a growing body of evidence based on biochemical, genetic and cell biology that implicates the alternative pathway of complement in the development of AMD. In particular, the complement factor H (CFH) gene, where a nucleotide change results in a tyrosine (Y) to histidine (H) exchange in short consensus repeat 7 (amino acid 402), increases the AMD risk dramatically. CFH is the soluble regulator of the alternative pathway of complement, and is essential in slowing the spontaneous proteolysis or “tickover” of C3→C3b in the plasma. Although it is now apparent that dysregulation of the complement cascade, and of the alternative pathway in particular, is an important predisposing step in AMD development – how to best target complement dysregulation pharmacologically remains undefined. A critical unmet need is to provide evidence supporting the use of therapies targeting complement inhibition for dry AMD in relevant AMD models. We have developed AMD mouse models that faithfully recapitulate many aspects of AMD that – like AMD – are based on multiple risk factors including advanced age, immune system dysregulation and consumption of a high-fat, cholesterol-enriched Western- style diet. These chronic early/intermediate AMD models provide the first opportunity to test the efficacy of targeted immune-based therapies. These models will also likely help to unravel why therapies targeting complement proteins have had limited success in treating humans with AMD to date. I will be describing these models and the outcomes of preclinical testing of therapies targeting the complement system. 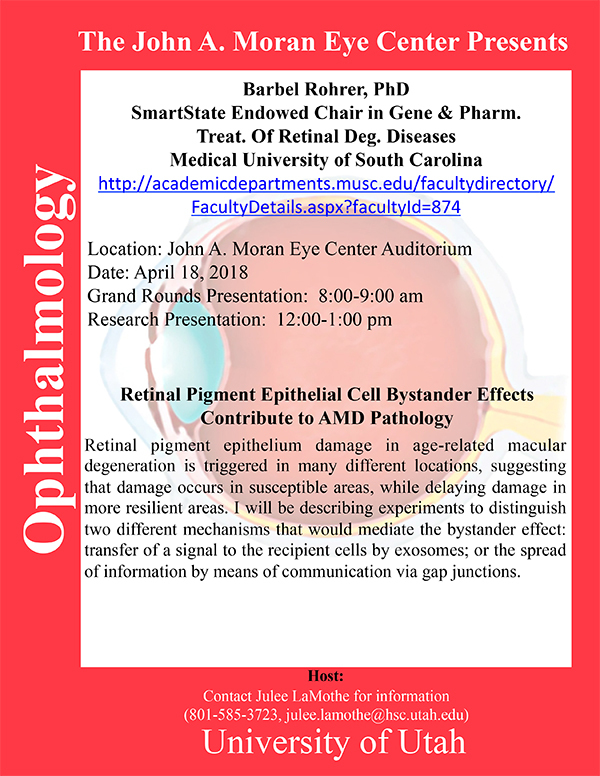 Barbel Rohrer, the SmartState Endowed Chair in Gene and Pharmacological Treatment Of Retinal Degenerative Diseases at Medical University South Carolina will be delivering a seminar on “Retinal Pigment Epithelial Cell Bystander Effects Contribute to AMD pathology” on Wednesday, April 18th at 12:00 Noon in the Moran Eye Center auditorium. Abstract: Retinal pigment epithelium damage in age-related macular degeneration is triggered in many different locations, suggesting that damage occurs in susceptible areas, while delaying damage in more resilient areas. I will be describing experiments to distinguish two different mechanisms that would mediate the bystander effect: transfer of a signal to the recipient cells by exosomes; or the spread of information by means of communication via gap junctions. Nicholas A. Delamere, Professor and Head, Dept. of Physiology; Professor, Dept. 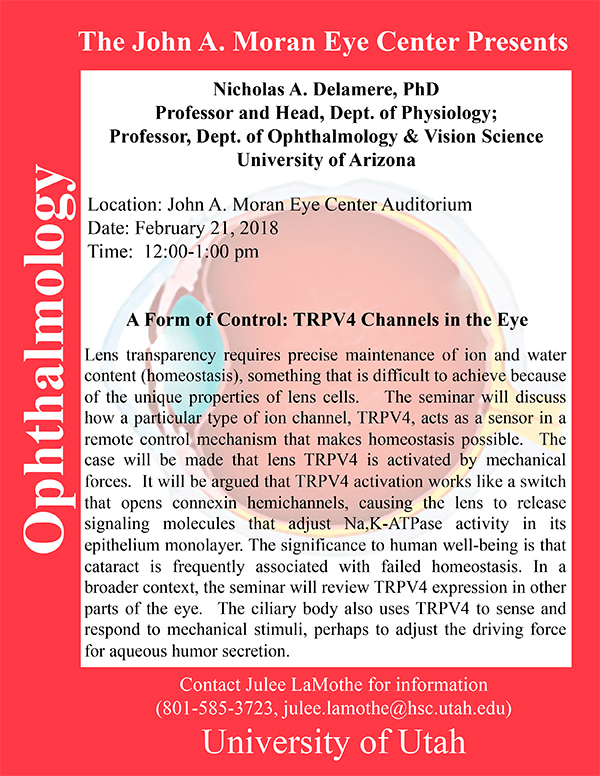 of Ophthalmology & Vision Science, University of Arizona will be delivering a seminar on “A Form of Control: TRPV4 Channels in the Eye” on Wednesday, February 21st at 12:00 Noon in the Moran Eye Center auditorium. Abstract: Lens transparency requires precise maintenance of ion and water content (homeostasis), something that is difficult to achieve because of the unique properties of lens cells. The seminar will discuss how a particular type of ion channel, TRPV4, acts as a sensor in a remote control mechanism that makes homeostasis possible. The case will be made that lens TRPV4 is activated by mechanical forces. It will be argued that TRPV4 activation works like a switch that opens connexin hemichannels, causing the lens to release signaling molecules that adjust Na,K-ATPase activity in its epithelium monolayer. The significance to human well-being is that cataract is frequently associated with failed homeostasis. In a broader context, the seminar will review TRPV4 expression in other parts of the eye. The ciliary body also uses TRPV4 to sense and respond to mechanical stimuli, perhaps to adjust the driving force for aqueous humor secretion. 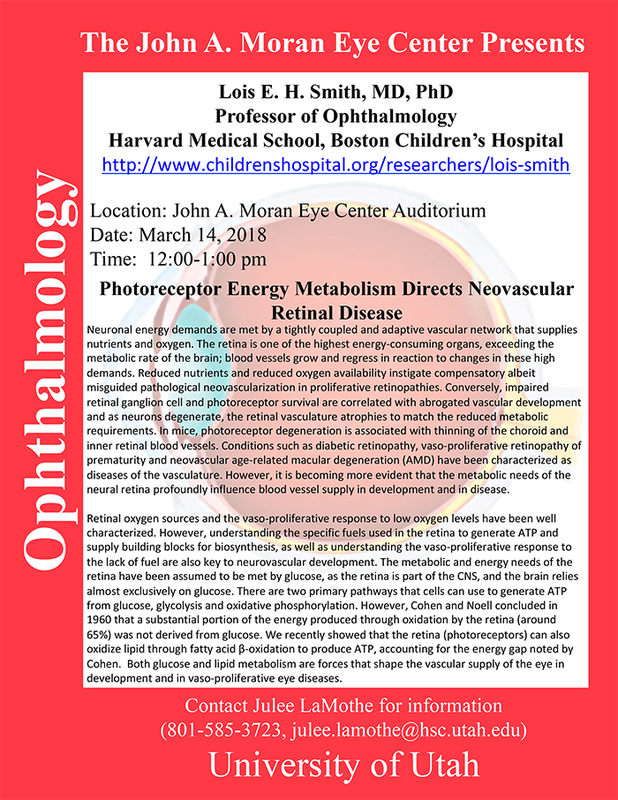 Lois E. H. Smith, Professor of Ophthalmology at Harvard Medical School, Boston Children’s Hospital will be delivering a seminar on “Photoreceptor Energy Metabolism Directs Neovascular Retinal Disease” on Wednesday, March 14th at 12:00 Noon in the Moran Eye Center auditorium. Abstract: Neuronal energy demands are met by a tightly coupled and adaptive vascular network that supplies nutrients and oxygen. The retina is one of the highest energy-consuming organs, exceeding the metabolic rate of the brain; blood vessels grow and regress in reaction to changes in these high demands. Reduced nutrients and reduced oxygen availability instigate compensatory albeit misguided pathological neovascularization in proliferative retinopathies. Conversely, impaired retinal ganglion cell and photoreceptor survival are correlated with abrogated vascular development and as neurons degenerate, the retinal vasculature atrophies to match the reduced metabolic requirements. In mice, photoreceptor degeneration is associated with thinning of the choroid and inner retinal blood vessels. Conditions such as diabetic retinopathy, vaso-proliferative retinopathy of prematurity and neovascular age-related macular degeneration (AMD) have been characterized as diseases of the vasculature. However, it is becoming more evident that the metabolic needs of the neural retina profoundly influence blood vessel supply in development and in disease. Retinal oxygen sources and the vaso-proliferative response to low oxygen levels have been well characterized. However, understanding the specific fuels used in the retina to generate ATP and supply building blocks for biosynthesis, as well as understanding the vaso-proliferative response to the lack of fuel are also key to neurovascular development. The metabolic and energy needs of the retina have been assumed to be met by glucose, as the retina is part of the CNS, and the brain relies almost exclusively on glucose. There are two primary pathways that cells can use to generate ATP from glucose, glycolysis and oxidative phosphorylation. However, Cohen and Noell concluded in 1960 that a substantial portion of the energy produced through oxidation by the retina (around 65%) was not derived from glucose. We recently showed that the retina (photoreceptors) can also oxidize lipid through fatty acid β-oxidation to produce ATP, accounting for the energy gap noted by Cohen. Both glucose and lipid metabolism are forces that shape the vascular supply of the eye in development and in vaso-proliferative eye diseases. 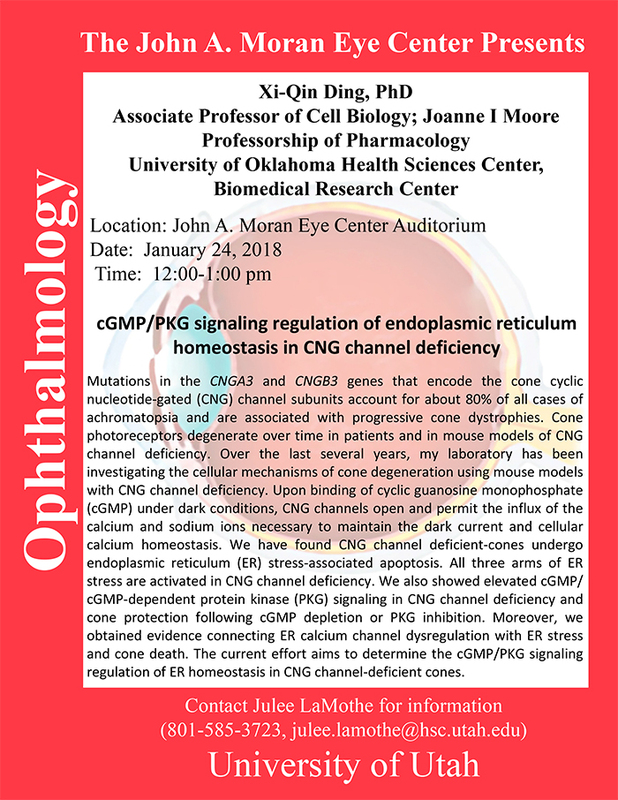 Xi-Qin Deng, Associate Professor of Cell Biology, and the Joanne I Moore Professor of Pharmacology at University of Oklahoma Health Sciences Center will be delivering a seminar on “cGMP/PKG signaling regulation of endoplasmic reticulum homeostasis in CNG channel deficiency” on Wednesday, January 24th at 12:00 Noon in the Moran Eye Center auditorium. Abstract: Mutations in the CNGA3 and CNGB3 genes that encode the cone cyclic nucleotide-gated (CNG) channel subunits account for about 80% of all cases of achromatopsia and are associated with progressive cone dystrophies. Cone photoreceptors degenerate over time in patients and in mouse models of CNG channel deficiency. 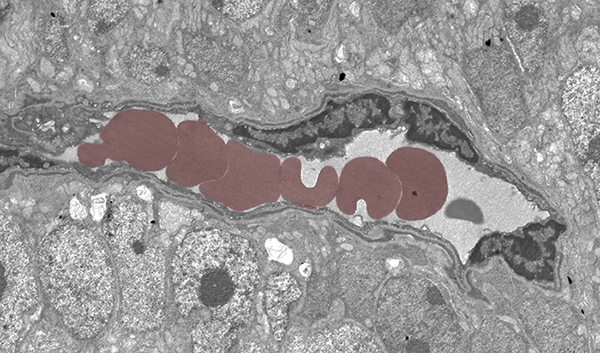 Over the last several years, my laboratory has been investigating the cellular mechanisms of cone degeneration using mouse models with CNG channel deficiency. Upon binding of cyclic guanosine monophosphate (cGMP) under dark conditions, CNG channels open and permit the influx of the calcium and sodium ions necessary to maintain the dark current and cellular calcium homeostasis. We have found CNG channel deficient-cones undergo endoplasmic reticulum (ER) stress-associated apoptosis. All three arms of ER stress are activated in CNG channel deficiency. We also showed elevated cGMP/ cGMP-dependent protein kinase (PKG) signaling in CNG channel deficiency and cone protection following cGMP depletion or PKG inhibition. Moreover, we obtained evidence connecting ER calcium channel dysregulation with ER stress and cone death. The current effort aims to determine the cGMP/PKG signaling regulation of ER homeostasis in CNG channel-deficient cones.